It may not look stylish, but it works. Here’s yet another reason why it’s a mistake to ban plastic grocery bags, as Corvallis and a number of other cities have done. 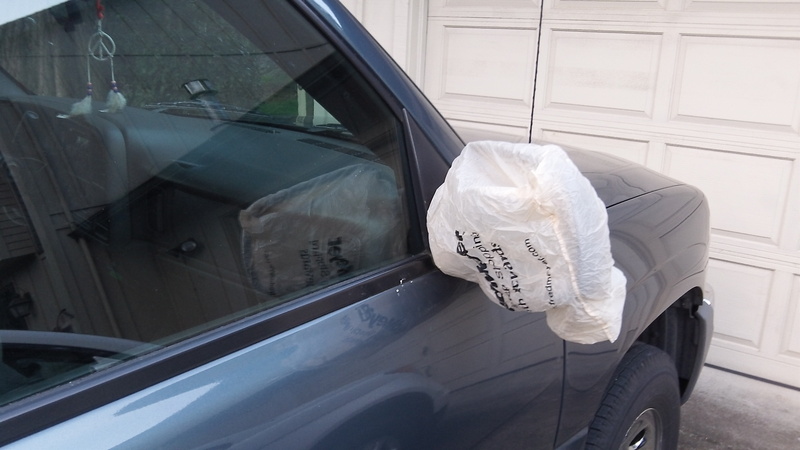 What you see here are bags — from Fred Meyer in Albany in this case — shrouding the side mirrors to protect them from crazy birds. This time of year some chickadees or juncos or some other kind of sparrow-size birds have taken to going nuts over their reflections around here. They perch on the tops or truck and car doors so they can see themselves in the mirrors.There they sit and peck away at the glass, and after a while you can see marks left by their sharp beaks. While they’re at it, they also mess up the doors. I’m no kind of ornithologist, but I thought this was some kind of mating behavior gone horribly wrong. What I learned from the internet, the fount of all kinds of practical knowledge, is that birds become more territorial in the spring, and when they see themselves in the mirror, they think someone just like is getting too close and want to drive them off. Fighting your own image to make it go away sounds like a really bad neurosis. But it’s just normal behavior for birds that are smart in lots of ways — flying, for one — but kind of challenged in many others, like this one. My online source advises two ways of discouraging bird attacks on mirrors. One is to spray on a soapy film to dull the reflection. But unless you want to clean your mirrors every time to start out, it may be hard to see that 18-wheeler coming up on your right next time you’re on the highway. The other is to cover the mirrors. They suggest an old sock or a golf club cover. Are they kidding? How big to they think our feet are? The library re-cycles plastic bags to use as totes when patrons check out multiple books. A bag ban is silly. A ban, while it animates our extra-enlightened brethren in Corvallis, pointlessly inconveniences many while achieving little, if any, environmental gain. 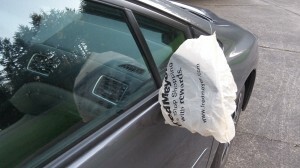 There’s also other uses for plastic bags. I haven’t bought PLASTIC garbage bags in over 20 years. 1. Carrying small items I purchase while riding my bike such as prescriptions or other items deemed to small to need a bag. 2. Hand it to the person whose dog just left a deposit on my lawn.